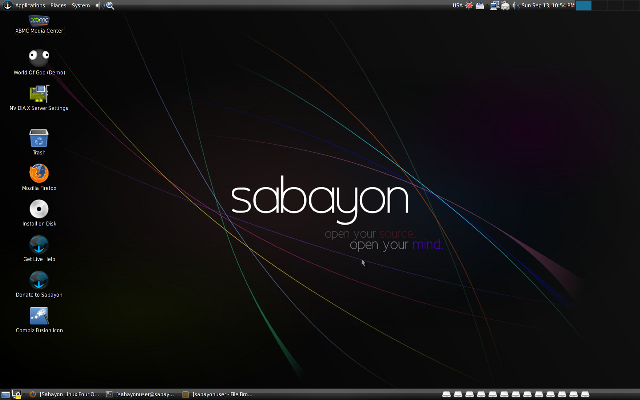 Sabayon brings a more accessible, easy to use and fast way of doing business and home computing in a Web 2.0 flavour. New approaches, new ways of facing user-related issues start today. So, don't wait any longer, bring this magic to your PC and get ready for the future! For you, Sabayon offers an easy to use and attractive desktop coming with thousands of tools and applications, such as effortless connections to any kind of wireless network, Web and Multimedia applications (Java, Flash Player, Google Earth, Picasa, etc), browsers (Firefox, Opera, Konqueror, etc), instant messaging clients (Pidgin, Kopete, aMsn, etc), multimedia and playback tools (Elisa Media Centerl, GeeXbox, VLC, Smplayer), productivity tools (OpenOffice, Abiword, Gnucalc, Kontact, Adobe Reader).